Turkish police have raided opposition media organizations and detained 24 people – including journalists, executives, and ex-police chiefs – as President Erdogan continues his campaign to muzzle political opponents. 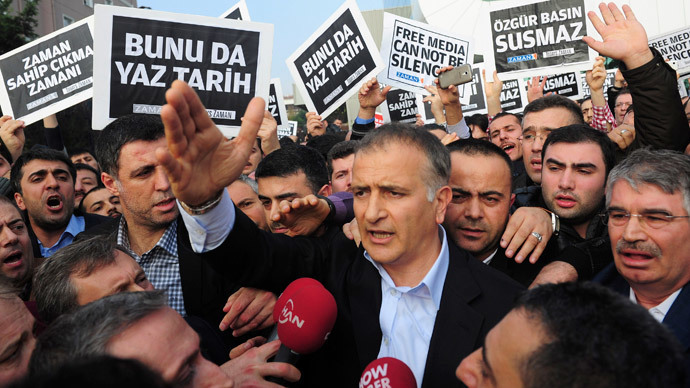 Police raided the offices of Zaman – a popular daily which is critical of President Recep Tayyip Erdogan’s regime – and Samanyolu television, an international TV channel, on Sunday morning in an operation against what Erdogan says is a terrorist network conspiring to topple him. The move comes as part of the president's ongoing battle with his long-standing rival, US-based cleric Fethullah Gulen. Journalists, television producers, scriptwriters, and former police chiefs were among those detained in the cross-country raid, which was an effort to root out anti-government conspirators. Arrest warrants were issued for 31 people on charges of “establishing a terrorist group,” forgery, and slander, according to a statement made by Istanbul Chief Prosecutor Hadi Salihoglu. The raids have faced international backlash. The EU has come out against them in a harshly worded statement, bringing Turkey’s EU aspirations into question. "The police raids and arrests of a number of journalists and media representatives in Turkey today are incompatible with the freedom of media, which is a core principle of democracy," EU officials said. “Media freedom, due process, and judicial independence are key elements in every healthy democracy. As Turkey's friend and ally, we urge the Turkish authorities to ensure their actions do not violate these core values and Turkey's own democratic foundations,” said State Department spokesperson Jen Psaki. On Friday, Erdogan vowed to hunt down Gulen’s “evil forces” with renewed vigor. "We have gone into their lairs and we will go into them again. Whoever is beside them and behind them, we will bring down this network and bring it to account," he told a business forum in Ankara. Gulen, a moderate Muslim cleric living in self-imposed exile in Pennsylvania since 1999, denies accusations of plotting against the state. 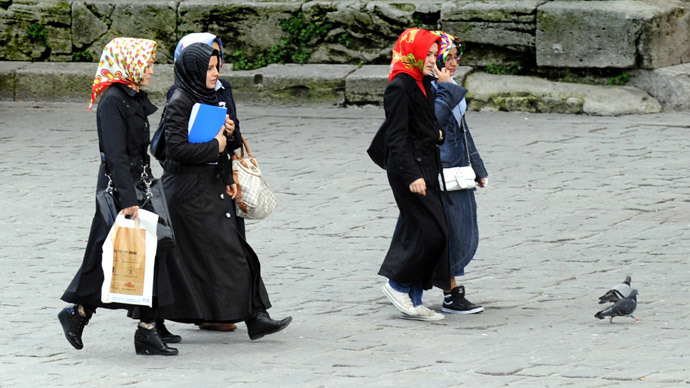 The spiritual leader of the Hizmet movement was once one of Erdogan’s top backers, prior to an attempt by Erdogan to shut down the cleric’s schools. Relations between Erdogan and Gulen further deteriorated following an anti-graft probe launched against Erdogan and his inner circle last year, in what was one of the biggest scandals to rock the nation. Erdogan suspects the cleric and his supporters are behind the probe. Four cabinet ministers were forced to resign as a result. Erdogan responded by declaring an all-out war on what he called a “parallel state,” firing police officers and prosecutors by the thousands and cracking down on opposition media. Many of those arrested see the move as a blow to Turkey’s embattled free press. 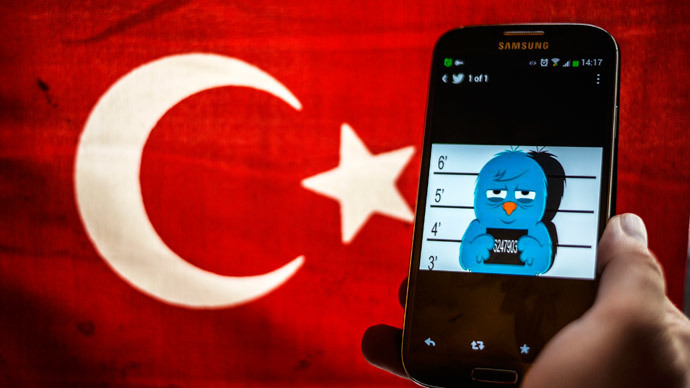 Turkey ranks 154th – just after Iraq – out of 180 countries on the Reporters Without Borders press freedom index. Before being detained, the head of Samanyolu TV, Hidayet Karaca, decried the raids as "a shameful sight for Turkey." 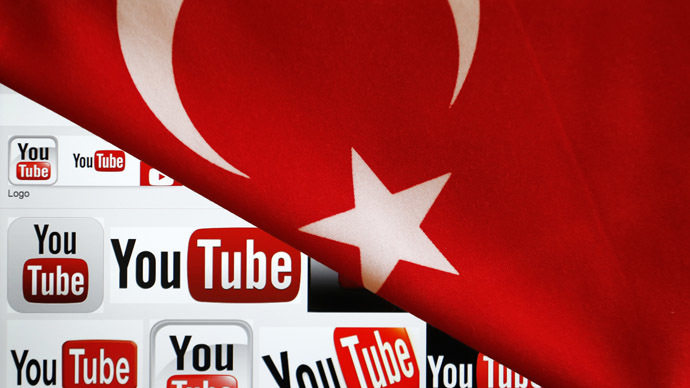 "Sadly in 21st century Turkey this is the treatment a media group with tens of television and radio stations, internet media and magazines receives," he said. The leader of the main opposition party CHP, Kemal Kilicdaroglu, called Edrogan’s administration a “coup government” intent on crushing all dissent. “A coup is being carried out against democracy," he lamented.